Like many of my friends, I tend to think of myself as, "an outsider." My circle of friends is always relatively small and shifts a bit over time but is always composed of rogues, misfits, and otherwise "strange" individuals. The commonality of individuals that I like spending time with is intelligence. This means I have generally found myself amongst the nerdy kids; the geeks who read and draw and game. And I admit, I'm a bit of a nerd myself. But when faced with the truly, deeply, excessively nerdy, I realize just how far from it I really am. 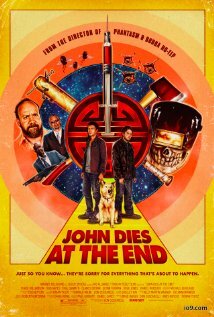 Some undefined amount of time ago, I started reading about John Dies At The End and I was entertained. I like a movie that isn't every other movie. I like a movie that offers me something new. I appreciate absurdity. But I can tell you that the amount of ranting provoked by finally watching this movie is enough to make my roommates wish they'd never put it on in the first place. I knew, without a doubt, within the first 60 seconds of the movie, that I hated it. By the half-way point, I was asking, "how long is this movie?" And about 15 minutes from the end, I had pretty much (mentally) checked out because steam was shooting out my ears. ..yes, internet, I do understand hyperbole. And I'm not even a basement dwelling mouth breather like ones who get into the type of socially inept nerdiness that produces things like John Dies at the End.